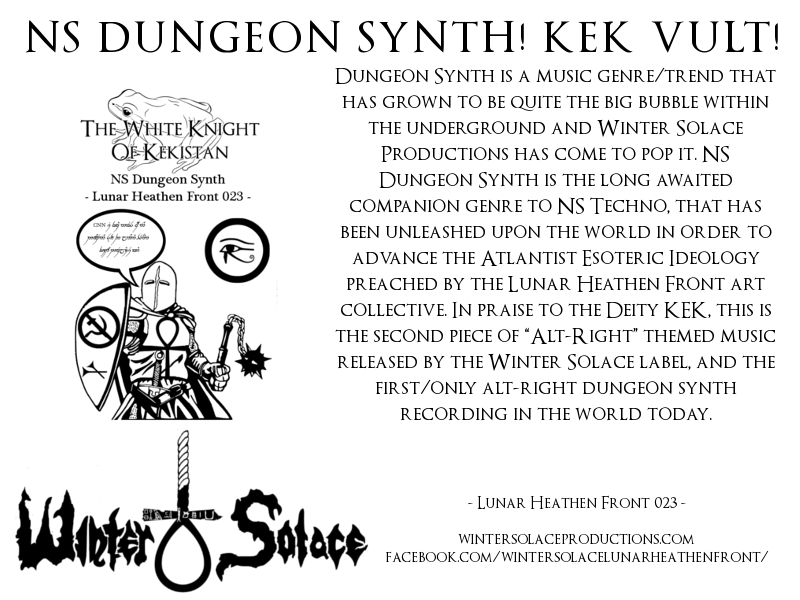 stenchforums.org • View topic - The White Knight Of Kekistan "NS Dungeon Synth"
The White Knight Of Kekistan "NS Dungeon Synth"
Fantasy Battle Ambient music coupled with commentary upon such subjects as: Alt-Right larping, The Saturn Moon Matrix, The Fake Reality and other such things deemed controversial by a frothing internet mob not ready for the wisdom contained upon these recordings. NS Techno makes us elite and NS Dungeon Synth makes us mighty! Re: The White Knight Of Kekistan "NS Dungeon Synth"
on yer bike, back to your basement, fucko.